Almost a year ago, I blogged about the longevity secrets of the world’s oldest man. Not surprisingly, this man’s favorite food is liver, long considered a sacred food by some of the world’s healthiest cultures. I came across another article recently about 112 year old Teresa Hu and was again fascinated by some of the aspects of her incredible longevity. The first thing that struck me is that she has no teeth! You may think this is a negative thing, but to me, it is clearly one of the reasons she has lived so long. Anyone her age who still had all their teeth would very likely have a bunch of root canals holding the dead teeth in place. There is little chance that Ms. Hu would still be alive if she had even one root canal. Dr. Weston A. Price DDS found decades ago the extreme health risk of having ANY root canals and even wrote a 1000+ page tome about it. His only son died of a root canal he himself put in which is what spurred him on to investigate the dangers of this health robbing dental procedure. Bottom line? Root canals are ALWAYS a source of constant infection in the body. They are NEVER sterile no matter what any number of clueless and misinformed dentists may have told you. Ms. Hu has, perhaps even unknowingly, helped her own longevity significantly by just having her teeth pulled instead of resorting to root canals over the years. Another interesting thing about Ms. Hu is that she does not eat any rice. She explains that she cannot chew as she has no teeth, so rice is not on the menu. At her age, digestion would be quite weak and rice is one of the most difficult to digest foods on the planet (along with all other grains). Skipping this food no doubt has contributed to adequate, albeit weak, digestion even at her advanced age! Ms. Hu suggested that perhaps part of the secret to her longevity lies with her habit of eating one raw egg for breakfast every morning. Given how easily digestible and full of balanced nutrition a good quality egg can be, there is no doubt that this dietary practice helped encourage Ms. Hu’s health through the years. The title of the article about Ms. Hu is The Power of Laughter. 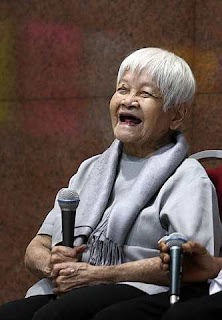 Ms. Hu herself suggests that to live long, “Make sure your heart is always happy”. She also shared that she did not console her friends grieving from the loss of loved ones and instead encouraged them to laugh and sing. We can all take away some great advice from Teresa Hu! Anecdotes or the Scientific Method?